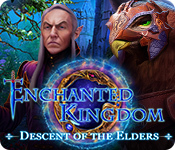 A hidden kingdom rises from beneath the waves, and that might just spell doom for everyone on land, everywhere, if you can't find a way to set an ancient curse right in this gorgeous hidden-object adventure. The Myths of the World series takes us into the formidable Slavic realms where Morana, the goddess of winter, plans to envelop the world in everlasting ice. You are no ordinary human, so you'll take it upon yourself to help Vesna, the goddess of spring, to defeat the cold and bring back the flowers and the birdies.